...it's hard making delicate wedding jewels when your fingers are numb. 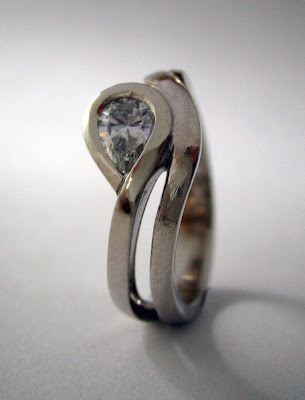 I made this engagement ring a couple of months ago for Abi and Tony. They're living in Canada now- I suppose I shouldn't complain about winter when there's not six foot of snow outside. But it's fast approaching Ugg-boots In The Gallery season. I saw a lady a few years back with a similar style ring and I was smitten right there and then...have never found one as pretty since...except today!!! so lovely! so so lovely! !